On the page that appears, use the search box to find “YouAppi”. You can view only your active configurations in the Integrated Partners list by checking the Filter By Partner Status box. You want to make sure that Youappi is an active configuration. This section is used for connecting Youappi with AppsFlyer. Youappi requires connecting with AppsFlyer via a unique ID given to the advertiser by Youappi. This ID may be called app ID, account ID, user ID, network ID etc. 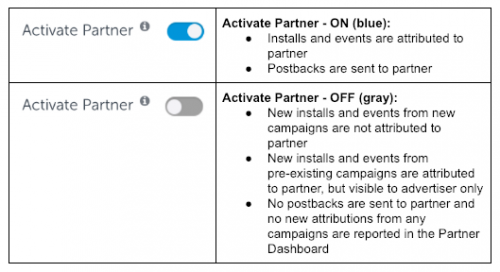 If attribution/integration is enabled for Youappi, AppsFlyer can send automatic postbacks to it following user installs, launches, re-engagements and rejected installs. Use this section to define the source of the users that postbacks are sent for.